Blackberries are a fruit that has a juicy sharp flavour and are grown in the wild. Blackberries are fantastic cooked in desserts where they particularly stand out or as part of a pie, strudel or a crumble. 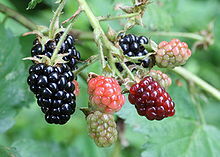 So if we can eat them, can rabbits eat blackberries at all and of they can, how much of them can be eaten? To find out more about hem, let take a look at their nutritional data to get some more information about them. In particular their sugar, fat, phosphorous, acidic, fibre, protein and calcium content particularly of interest. As you can see, blackberries have a hint of calcium and fat. However they do contain unite a bit of sugar and fibre. So rabbits can eat blackberries but only one per week at the very most. Anymore and they risk getting stomach problems. Also, only feed them ripened blackberries. Avoid any with a reddish colour. Can rabbits eat blackberry leaves? Rabbits are able to eat the leaves, but it is better to only feed the new leaves and avoid the older and tougher leaves. Don’t worry about the spikes as they aren’t dangerous. © 2019 onlinerabbitcare.com - All rights reserved.